Paper Goods: Paper Plates, Spoons, Napkins, Forks, etc. The free token offer cannot be combined with any other free birthday party offers. Our 8″ round cake is only $16.99. This serves appx. 12-15 people*. *72 hour advance notice required for all birthday cakes. You can also bring your own cake! Choose any single attraction: Go-Karts, Laser Tag, Miniature Golf for $5.00/ea. Do You Have Any Guests That Require Special Accommodations? Give Us A Call Prior To Booking Today To Discuss. 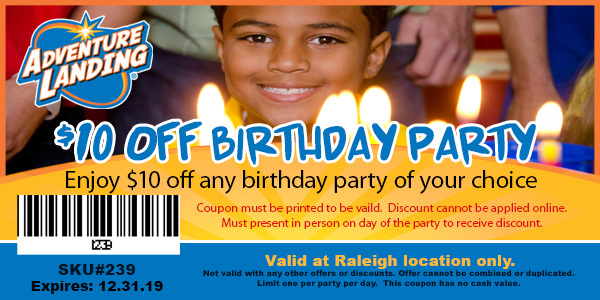 *Book your party as early as possible to reserve the date and time you want – space is limited!